The post I had planned for today isn't ready, but I don't want to break my streak of posts this week. I wore Sparitual Muse for way longer than planned because of a family emergency. It's an older shade, from the Fall 2008 Inspired collection. I bought it at TJ Maxx for around $4. I got SIX days of wear out of it, with just a bit of right hand tipwear. No chips at all! I rarely wear anything for more than a couple of days, so I don't know if I can really credit Sparitual's formula with the longevity...but it's still impressive. The color itself is really interesting. I didn't feel "trapped" wearing it for that long because it's got a lot of personality. 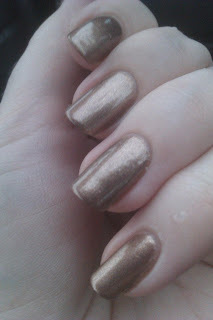 Muse is a slightly muted copper with fine gold, pink, and blue shimmer. I think this was three coats. Might have been four. It's one of those shimmers that plays with the light, brightening, darkening, or glowing. Sometimes it's soft, sometimes it's bold. Sometimes it's subdued. I need to wear it again sometime and get a photo of it in full sun because it lights up! The best I could do was a phone pic in the car on a rainy day. Bottom Line: If you see it at TJ Maxx, it's absolutely worth the $4-ish. They have a bunch of Sparitual shades at several stores (either TJ Maxx or Marshalls) in my area and I also got Circle Of Life, Dreams Becoming Reality, Running With Wolves, and Undercurrent. I need to get on it and finish this nail art for tomorrow! It's....pink!